After about a month, I started buying stencil supplies and then about a month later, I picked out paint samples from the hardware store, a plan churning in my head as I slowly peeled off the contact paper. Then, I went to Costa Rica for a month. About a month after my return, I bought paint…and a paintbrush…and a dropcloth. All the supplies sat in a bag for two months. If you are adding everything up, you will see that six months after I moved into my new apartment, I still had an ugly white dresser. It was an ugly white dresser that was destined for greatness….but still. While I fully accept my shortcomings in all things crafty (I was in grave danger of getting a C in the one required art class in high school), I embrace my abilities as a writer and a thinker. So this dresser became a symbol of much greater things in my life. 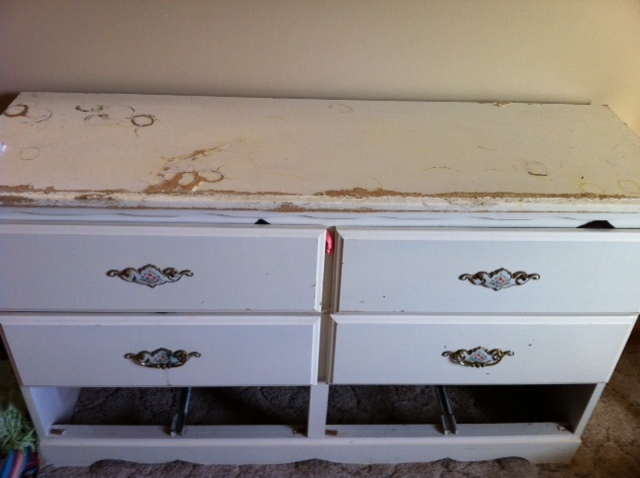 This white dresser with all of its childhood charms had since lost its shimmer. It needed a fresh coat of paint and a new story of being…it needed a little love. This old dresser needed me to take the time to consider its transformation. This dresser deserved to be acknowledged for what it could be rather than all the things it had been in the past. Y’all didn’t think a dresser had all these emotions, did you? And so one day I began. I found some spare time amidst my other titles in life as bartender, yoga teacher, daughter, friend, dog owner; and I stepped into my role as Furniture Restorer, Painter, Martha Stewart wannabe. I didn’t know what I was doing, but I started anyway..and figured it out soon enough. 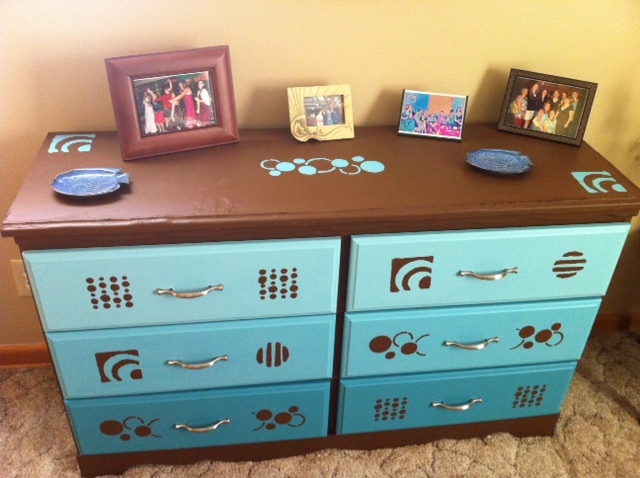 It took a couple weeks to finish the whole process…there were three different colors of paint, and stencils and drawers full of socks that had to be emptied and reorganized in the process. But then, it was done. If you look closely, you can still see some imperfections. There are smudges in my stencils and marred spots on the surface where the plywood underneath had just seen too much stress in its long life. No one would pay good money for this dresser in a store. But if you stand a ways away, and look at this dresser, she looks beautiful and ready to finally step into her role as centerpiece of the room. As the paint dried, I selected some framed photos to place on top. There are four and each of them show different groups of smiling faces, various women who have brightened my life. My mom, aunt and cousin are standing under a tree, my college girlfriends dance on a bar with me at my wedding, my childhood friends, all grown up, stand in a restaurant on our 30th birthday celebration, my Colorado book club makes silly faces as we all sit on a couch together. And so there are many reasons that my heart swells as I look at this dresser.